This covers basic information about wood as a material and applies equally whether you're using hand or power tools. There's lots of terminology to help you find your way around a lumberyard and talk intelligently to other woodworkers. This is a far more complex subject than I'm qualified to discuss, so I mostly just want to make you aware of it. You can find more information in the Wood Toxicity section of the links page. We think of woodworking as inherently safe because we're working with natural materials. We forget that the natural world is a constant riot of biological attack and defense mechanisms. Think venomous snakes and insects, predators, prey, and parasites, poison ivy and poison tree frogs, viruses and antigens. Common flowering shrubs like rhododenron, azaleas, and mountain laurel contain deadly toxins. Remember hemlock (the grassy weed, not the tree)? Humans and trees are part of that riot. Wood can be a biohazard. Toxins can be present in the sap and oils occurring in the wood. While the sap will dry out over time, the oils and residue remain. Fungi can also grow in the wood; spalted wood is desirable for its beautiful patterns, but you'll release spores into the air as you work it. Individuals vary in their sensitivity and can become sensitized over time. Problems can be caused by skin contact, breathing dust or fumes, or getting it in your eyes. They may occur only after long, repeated exposure, or with only brief exposure. The woodworking forums have some pretty scary anecdotes about people who've had serious reactions to various woods. In some cases these have been career-ending or life-threatening. Take the time to check up on the species you're working with. The exotic tropicals seem to be the most serious culprits, but don't make any assumptions. Medical personnel practice blood and body fluid precautions (BBFP). Without getting hysterical about it, you should take a similar approach when working with toxic species, even when using hand tools. Basic precautions are dust masks and respirators, eye protection and face shields, gloves, long sleeves and pants, aprons, and good ventilation. Handle waste carefully. Don't allow dust to spread outside the workshop; you don't want to contaminate your house if you work in the garage or basement. Sweep up debris without stirring the dust into the air. Use an active filtration unit that cycles the air in the shop. Use a vacuum with a HEPA filter, and be careful when emptying it. Setup a movable dust collection vent at your work station to capture the dust as soon as it's released. If you believe you're having a reaction and seek medical care, inform the medical personnel of your suspicions and details of the wood and chemicals you're using. Even if they aren't knowledgeable in the subject, they can pass those details on to poison control specialists or allergists. It may not seem such a risk, but if you're at all familiar with food or nut allergies, you know that people can be thrown into anaphylactic shock by something as apparently harmless as smelling a peanut in the same room. The very young and very old who may be present in your household are also more susceptible; their respiratory systems can be compromised more easily. Hardwood and softwood are botanical classifications identifying deciduous trees (angiosperms) versus coniferous trees (gymnosperms). Strictly speaking, it's not related to how hard a wood is (by various engineering measures), but as a practical matter it is. In general, most of the deciduous species are harder and resist tools and denting, while most of the coniferous species are softer, working and denting easily, but there are exceptions on both sides (for instance, balsa, a very soft wood used for modeling, is a hardwood). In North America, some native hardwood species are oak, ash, maple, hickory, beech, cherry, apple, pear, poplar, and walnut. Softwoods are eastern white pine, southern yellow pine, spruce, fir, cedar, and redwood. Exotic tropical hardwood species like rosewood, cocobolo, and padauk can be extremely hard. The Janka hardness test, which measures how much force is required to embed an 11.28 mm steel ball into wood to half the ball's diameter, is a practical rating of the relative hardness of different species. Here's a list of species ordered by rating. As a hand tool woodworker, your main concerns are workability and strength of the wood in application. Very hard woods can dull your tools quickly, requiring more frequent sharpening; they're almost unworkable with dull tools. Moderately hard woods may not take such a toll on the tools, but still require more effort to work than softwoods. The harder woods have more strength for a given cross-section than the softer woods, so are more commonly used for furniture. A two-foot length of 1"x1" maple for a side-table leg has a higher structural strength than the same size piece of white pine, and will form stronger joints. To get the same strength with pine, you would need larger cross-sections, which might not be as attractive. That can make the difference between an elegant hardwood table and a clunky softwood one. Where strength is not as important but ease of shaping is (for instance, in making moldings, which are decorative, not structural) you may prefer to use softer woods if color and grain matching allow. Tool handles, which may need to withstand rough use, are usually made from very hard woods. Because of their resistance to denting, hardwoods retain their edge and surface treatments better than softwoods. So the nice beads, chamfers, and crisp corners you formed on that maple table leg would survive for a century of banging around living rooms and moving vans. In pine, it would look like someone had beaten it with a chain after a while (which may be the look you're after). When it comes to milling and forming joints, hardwoods hold to nice precise tolerances (subject to moisture). Softwoods can be a bit mushy to work with. The fibers will compress or tear our more easily. Think of milling a block of aluminum versus a block of styrofoam. However, that compressibility means softwoods are more forgiving when assembling joints. Hardwood joints will split if you try and force pieces that are too tight. Furniture is often made of at least two species, a primary wood for visible elements, and a secondary wood of suitable strength for internal elements. For instance, poplar is a reasonably strong wood that works easily for secondary use, but is generally not as attractive as maple for primary use. Similarly, white pine may be used as a softer and cheaper secondary wood for drawer sides in a walnut dresser. As a beginner, do yourself a favor and start out with softwoods for practicing cutting and planing. It's easier to work, especially if you're still developing your sharpening skills. Then you can move on to the harder woods. For joinery practice, too much softness results in frustrating imprecision, so the softer hardwoods are a good compromise. Poplar is the most practical, followed by cherry. They work nicely without being too hard. Wood contains moisture. Always. Alive, it contains water in its sap. Dead and dried, it continues to absorb and release moisture as the seasonal conditions change, just like a sponge; it's hygroscopic. Also like a sponge, its size changes with the moisture, shrinking and swelling, known as movement. Thus it always has some degree of dimensional instability. The Moisture Content (MC) of wood is expressed as the percentage ratio of the weight of water in the wood to the weight of the wood itself after it's been oven-dried. There's a great picture in R. Bruce Hoadley's Understanding Wood at the start of the chapter "Water and Wood". It shows a fist-sized block of freshly-cut red pine being crushed in a vise over a beaker. The beaker holds nearly an inch of water. This wood has an MC of nearly 200%. That means the water held in the wood weighs twice as much as the dry wood itself. When freshly cut, wood has too much moisture for most woodworking techniques, though "green woodworking" specifically takes advantage of its high initial MC. Otherwise joints come apart and things warp and crack as the wood loses its moisture. "Dry woodworking" requires the wood to be under 10% MC. This is achieved by controlled drying after it's been cut, usually in a large kiln. It can also be air-dried by stacking and stickering (stickers are spacer strips that allow air to circulate around the lumber). Air-drying brings the wood into equilibrium with the local atmosphere over time. Depending on local conditions, this may be in the 12-20% range. Hoadley states that the most important item in his book is the relationship between Relative Humidity (RH) of the atmosphere and MC. As RH increases, wood absorbs moisture, increasing MC, and as RH decreases, wood desorbs moisture, reducing MC. These changes in RH are the result of seasonal changes (depending on your local geography). Humidity decreases in the cold winter and increases in the warm summer, with indoor conditions ranging from below 30% to above 80%. Even the most seasoned wood is contracting and expanding like a still-living thing breathing over the course of a year. Movement creates stresses that can tear furniture or cabinetry apart over time. It can exert tremendous force on the parts. Swelling causes compression, pushing against adjacent parts; shrinkage causes tension, pulling on adjacent parts. Good structural design must account for this. A critical point to remember is that shrinkage and swelling are most significant across the grain, not along it. To understand this, first note that there are three directions of orientation in a tree: tangential, radial, and longitudinal. Geometrically, tangential refers to any line perpendicular to a line out from the center, but effectively, it's any line across the growth rings except through the center. Radial refers to any line from the center of the trunk out through the rings to the bark (i.e. a radius). Longitudinal refers to any line up and down the length of the trunk. Tangential change is the greatest. Radial change is somewhat less (as little as half, depending on species). Longitudinal change is negligible, so can be ignored. The amount of change is a percentage of the dimension. The exact percentage for width and thickness depends on species and orientation of rings in the board, but for simplicity assume 5%, or 1/20th. In a board 10" wide by 3/4" thick, 1/20th of the width is half an inch, but 1/20th of the thickness is only 3/80", the thickness of a couple of playing cards. So the width of a piece of wood will change noticeably, and it's thickness a small amount, but it's length will not. The amount of change in narrow pieces is small, because it's a percentage of a small width; in a piece 2" wide, 1/20th of the width is only a tenth of an inch. That's why the frame-and-panel construction was invented for doors and chests. The frame consists of long narrow members that are dimensionally very stable. The panel, which is subject to larger changes in width, rests floating loose in a groove around the inside of the frame (it can also be pinned in the groove at the center of its width for even movement on each side). It may change by 1/4" or more through the year. Gluing it in place, or fitting it exactly in the groove during the winter without clearance, defeats the purpose. When the panel expands in the summer, it will blow the frame apart. When you assemble a piece, you have to think about what time of year it is and how the wood will change. Attaching tabletops is another area where you have to plan for movement. That's a big wide expanse of wood. The frame underneath is similar to the frame in frame-and-panel construction, long narrow members attached to long narrow legs, so those parts are stable. If you secure the top rigidly to it, the movement of the top will pull the frame apart or cause the top to buckle. There are various fastening strategies, such as elongated screw holes in the frame stretchers, wooden buttons that screw to the top with a tongue that fits in a groove in the stretchers, and figure-8 fasteners where one side is screwed to the frame and the other is screwed to the top; they then pivot slightly as the wood moves. Movement can be safely ignored in some instances. The top, sides, and bottom of a bookcase are an example, joined at the corners, as well as the shelves fitting in dadoes cut into the sides. Assuming all the parts are the same species and grain orientation, they will all swell and shrink in width together. It's the differential movement across different axes or between parts with differing dimensional stability that's a problem. The back of the bookcase needs to account for movement, or it will blow the sides off. It could be frame and panel, or tongue and groove (with the pieces secured only at the centerline top and bottom, loose in the grooves). The width of the gap between pieces varies with movement, changing the reveal of the tongue without being able to see through it completely. A plywood back is dimensionally stable because the thin layers of veneer are held in opposition, the grain aligned on perpendicular axes. The movement across the grain of one layer is held in check by the stability along the grain of adjacent layers securely bonded to it. Even dry wood can have some variation in MC through its thickness. If you resaw the wood into thinner pieces, you expose the inner, moister wood to the air. The difference in MC between the sides of each piece can cause them to warp as they dry out. If the wood was flat before resawing, the moist side may shrink, curving the wood. It will reach a new equilibrium of shape and moisture. Think of how a dry sponge warps if you moisten one side of it. When you bring wood into your shop, which may have a different humidity than where it's been stored the last few months, you should give it at least a few days to acclimate before cutting it. That allows the wood to get any movement out of it system. However, it's not a guaranteed disaster if you don't have time for that, just an increased risk of problems. In general, the main thing you always need to consider is how the individual pieces of a project will change in width. How much will they move? How will the resulting forces bear against other pieces? Will they blow out joints, cause buckling, or pull things apart? Or will the finished project survive for two centuries? When applying finish to a project, be sure to finish all surfaces, including hidden ones and undersides. One purpose of a finish is to reduce changes in MC. Leaving one side unprotected will result in uneven moisture changes. This will cause warping. Trees grow by adding new outer layers of sapwood. This is the portion that actually carries sap. Growth rings appear due to the difference in earlywood, the initial spring growth in a year, and latewood, the subsequent growth. Latewood is usually denser. The layers of lighter earlywood and darker latewood easily visible in the end, edge, and face grain of this piece of pine. The curvature of the rings shows that the core of the tree was on the left, and the bark on the right. Hardwoods are divided into ring-porous, semiring-porous, and diffuse-porous types. Ring-porous species such as oak and ash have large earlywood pores and small latewood pores. Diffuse-porous species such as cherry and maple have roughly equal early and latewood pores. Semiring-porous species such as walnut and butternut have more variation among individual specimens. The sapwood eventually transforms into heartwood, in the process depositing compounds called extractives. The extractives in heartwood give it color and decay resistance. Sapwood is much paler in color and decays quickly due to its lack of extractives. 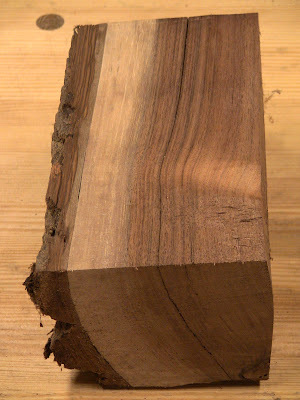 This section of black walnut illustrates the light sapwood just under the bark, and the dark heartwood on the right. This is a semiring-porous wood. Depending on how lumber is processed, sapwood may be removed. While the color variation can be an interesting visual element, you'll generally want to use heartwood for your pieces. The pith is the heartwood at the very center. It may contain internal cracks, and is generally undesirable. Grain refers to the fibers that make up the wood. It varies by species in texture and straightness. Close grain refers to fine texture, with small, closely spaced pores, such as cherry. Open grain refers to coarse texture, with larger, open pores, such as oak. Cross grain refers to deviation from the longitudinal direction along the trunk. Interlocked grain refers to alternating spiral grain through growth rings, such as elm, making for difficult planing. End grain after shooting on a shooting board. 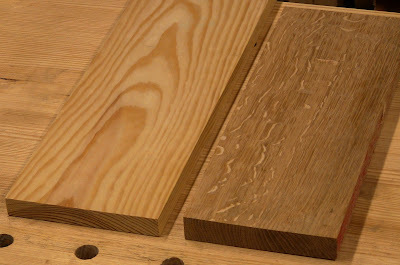 Open-grained oak on the left, close-grained cherry on the right. This also illustrates ring-porous and diffuse-porous hardwoods. The open pores of the oak look like pin holes poked in the end. Face grain of the same two pieces. At this magnification, the pores exiting the face of the oak look like worm holes. The direction of grain, the orientation of the fibers in a specific board, affects its strength and how you work it. Wood is strongest along the length of the grain, much weaker across it. When wood splits, the split follows the grain. When you see martial arts demonstrations breaking boards, they always break along the grain. Riving is the controlled splitting of wood along the grain. Chairmakers use this to create chair parts of long, continuous fibers; sawing cuts across the fibers, resulting in weaker parts. 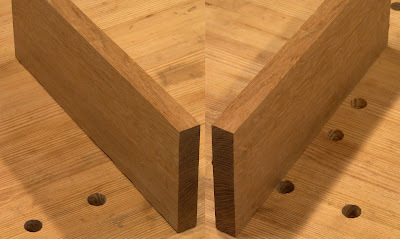 When forming joints, you make them so that forces across the joint are across the grain, not with it, otherwise the joint will easily snap off. Strength along the grain also determines how to glue up pieces. The strongest glue joints occur with long-grain to long-grain, as in edge-gluing, with little or no additional support required. In fact, the glue joint is generally stronger than the wood itself; do the karate demonstration, and the glued-up board will break somewhere other than at the glue line. Cross-grain gluing is much weaker and will twist off easily, tearing off fibers, but is strong when supported by a mechanical joint, as in a mortise and tenon. 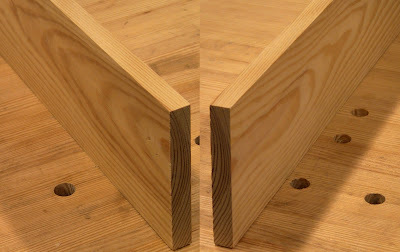 Here the faces of the tenon meet up with the faces of the mortise at a right angle, so there's still long-grain to long-grain contact. The mechanical housing of the joint supports it against twisting forces. 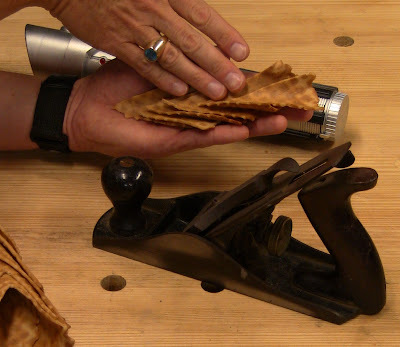 End-grain gluing has almost no strength, especially end-grain to end-grain, such as trying to make a long board by butting the ends of two shorter ones together; it will break off with the slightest force. 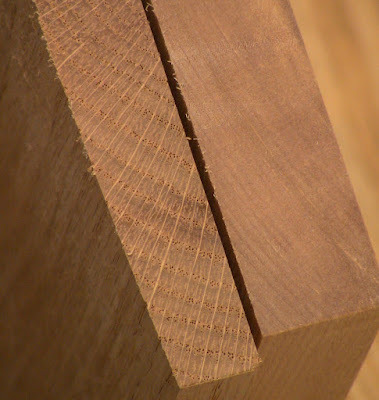 End-grain to long-grain gluing in a mechanical joint, as in the narrow faces of a tenon meeting the ends of a mortise or a board end sitting in a dado, contributes a small amount of strength, but only because the joint supports it against forces. Without the joint, it's just as weak as the end-grain to end-grain, such as trying to form a T shape by butting the end of one board to the edge of another. Common analogies for grain are bundles of drinking straws leaning at an angle, feathers, or the fur on a cat. When you run your hand along with the grain, it's smooth. When you run your hand against the grain, it's rough and jumpy. A porcupine or hedgehog is another good analogy: run your hand with the lay of the quills, and you won't get stuck. Run your hand against them, and you've got problems. But the most practical analogy is one Chris Schwarz describes in Handlplane Essentials, in the article "Understand Grain Direction", which he credits to Russell Jokela. Because trees are smaller at the top than at the bottom, each new layer of sapwood that grows is roughly cone shaped. So a tree is like a stack of ice cream cones. Run your hand down the stack, and it rides smoothly over them. 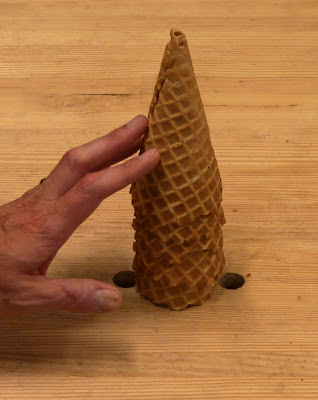 Run your hand up the stack, and it catches the edges of the cones, damaging them and upsetting the stack. Down the stack is with the grain. Up the stack is against the grain. 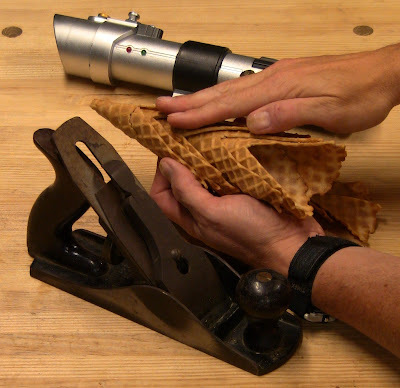 Now slice down one side of that stack of ice cream cones with a light-saber, the way a lumber mill slices down the length of a log. Look inside the sliced off section: you'll see cathedrals, peaked shapes pointing up toward the top, opening toward the base. These patterns are the cross sections of the cones; they show up in the board faces. After slicing, the cathedrals in the bark-facing side on the left and the heart-facing side on the right. When planing, you always want to go with the grain. Planing against the grain results in the edge of the iron digging in and catching the edges of the layers, just like the ice cream cones above. This causes tearout, gouging and chipping of the wood, and makes the plane chatter and jump. Likewise with a chisel; a plane is nothing more than a short, wide chisel held in a frame at a fixed angle. A chisel will dig in even worse and do more damage to the wood when used against the grain. How do you know which way to go? Sometimes it's easy to read the grain lines in the edge or face of a board and see them sloping up. When planing the face, look at the edge, and push your plane in the direction that follows them uphill. Similarly, when planing the edge, look at the face, and push in the direction that follows them uphill. Imagine that stack of cones on its side; for smooth motion, you would push your hand up against their slopes, pushing them together. Reading the edge grain shows how you would plane the faces. Here it rises from left to right, and falls from right to left. For the top face, you would go left to right. For the bottom face, you would go right to left. The bottom face of the same board. Reading the face grain shows how you would plane the edges. Because the cathedrals are roughly wedge shaped, here it rises from left to right on the top, and falls from left to right on the bottom. You would go left to right for both edges. But sometimes it's not so easy to read the edge grain. That's where the cathedrals come in. You can read them to see how to plane the faces as well. In the stack of cones you sliced down one side, the smaller part you sliced off faces the center, or heart, and the bigger part faces the outside, or bark. These are the same as the two faces of a board, one facing the heart of the log, and one facing the bark (you can identify heart side and bark side by looking at which way the rings curve on the end grain). The two faces of a piece of flatsawn pine, showing the cathedrals facing the heart and facing the bark. 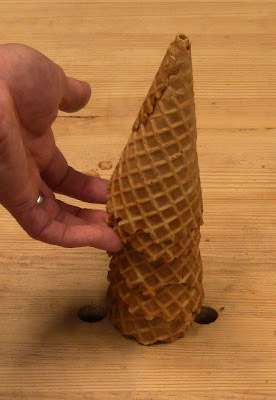 Which way would you run your hand on each slice of cones to avoid catching on them and knocking them over? On the one facing the heart (the heart side), you would go up the cathedrals, from base to narrowing point. On the one facing the bark (the bark side), you would go down the cathedrals, from point to expanding base. Luke, come to the bark side! On the heart side, point the plane up the cathedrals. On the bark side, point the plane down the cathedrals. The mnemonic that Schwarz uses for the bark side is that his plane is like a dog running forward, the cathedral like the barking sound expanding from its mouth. Bark; forward; expanding; got it? What if the grain reverses, rising and falling along the same face or edge? You have to reverse your plane at the point the grain reverses so you're always working with the grain. If you try to push on past that, you'll go from working with the grain to working against it, and the plane will jam up short. Knots can be a source of grain reversal, as the fibers curve around them. Some grain can reverse repeatedly, making for a difficult challenge. Grain parallel to the edge or face, that doesn't clearly rise or fall, can be planed from either direction, though often one will turn out to be a little smoother than the other. As a beginner, start out practicing with straight-grained lumber. That'll make your life much easier until you've mastered planing. You may need to cut out portions that have reversing grain. Logs are sawn into boards in a variety of sequences to get the best yield. These can be summarized as two types of cuts: flatsawn, and quartersawn. In flat sawing, the log is cut tangentially to the growth rings. 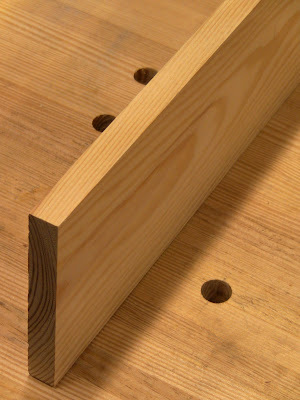 In the simplest version, "through and through" or "flitch cut", it's sliced down its length repeatedly (or with a set of gang saws) into boards. The very center boards will contain pith, which usually results in severe cupping when dried. However, these boards can be ripped on either side of the pith to produce the equivalent of quartersawn boards, transforming some of the worst boards into some of the best boards. For flat sawing high quality lumber, the log is sliced down its length repeatedly until a defect is found, producing the best boards, then it's rolled 90 degrees to get the next best boards, and so forth, until a square core is left, known as "boxing the heart". This core contains the pith, and is used for low-quality lumber. Flatsawn boards can be identified by semicircular growth ring sections in the ends, and pointed cathedral patterns in the faces. Most lumber is flatsawn. The two faces of a piece of flatsawn pine. The curved rings are roughly parallel to the faces. The left face is the heart side. In quarter sawing, the log is first cut down its length into quarters (the cross-section resembles pie wedges). The quarters are then sliced down their length radially, across the growth rings. This method produces less usable lumber because of the small sections at the sides of the wedges, so is more expensive and is less frequently available. The advantage of quartersawing is that the wood is much more dimensionally stable, since movement in the radial direction due to moisture change is much less than movement in the tangential direction. In quartersawn boards, the width of the board is radial, and only the thickness is tangential. 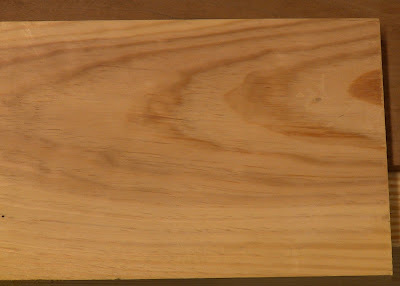 Quartersawn boards can be identified by short, nearly straight growth ring sections in the ends, and straight long grain lines down the length of the faces. In species such as oak and sycamore, this also produces ray flake, ribbons across the long grain, caused by ray cells running from the center of the tree to the sapwood. Ray flake can make for spectacular grain patterns when the wood is finished. Two common uses of quartersawn lumber are in the Arts and Crafts style of furniture, and planemaking, where the wooden plane body needs to be very stable over time. The two faces of a piece of quartersawn oak. The rings are nearly straight across, at right angles to the faces. There's just enough curvature in them to tell that the bottom edge is the heart side. Flatsawn (bark side up) vs. quartersawn (bark side left). The cathedrals in the face of the pine are replaced by nearly straight lines in the face of the oak. The pale streaks in the oak are the ray flake. As you move your head around to change the viewing angle, the light makes them shimmer like some 3D holographic effect. Lumber can have a number of possible defects. Some can be worked around by cutting the bad part off, some can be worked by corrective planing, some can be incorporated as visual elements, and some aren't worth the trouble. Try to select the best pieces from the stack that match your needs. However, many times the perfect piece just doesn't exist; there will always be some waste due to defects, so plan on a little extra. Even if the lumber looks good when you buy it, defects can occur as your store and work it. Your workspace may have more or less moisture, resulting in movement as the wood acclimates. If you store it poorly, it may warp due to sagging or having things piled on it, or get wet. Once you start working it, you may release internal stresses or expose interior moisture to the air. Bow: warped flatness along the length of a board. 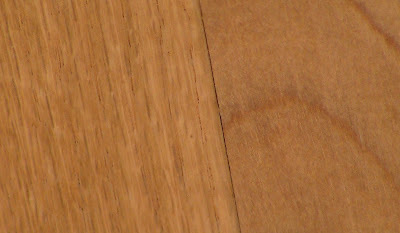 Check: crack along the grain due to the stress of uneven shrinkage, often at the exposed ends of a board. Compression failure: line of buckling across the grain due to bending of the tree during wind storms, under snow load, or when felling. Crook: warped straightness along the length of a board (i.e. crooked). Cup: warped flatness along the width of a board. Holes: insect damage or nail holes. Kink: sharp crook due to a knot. Knot: the point where a branch grew. Pitch pocket: a void in softwood containing pitch. Shake: internal separation within the wood. Spalting: fungal decay with irregular discoloration and dark zone lines. Split: mechanical crack along the grain. Twist: the four corners don't line up in the same plane. Tearout: lifting of the surface when the planer struck shifting grain. Wane: bark, or any other lack of wood on the edge. When buying lumber at the mill or lumberyard, in addition to species and quantity, you may be able to specify quality, finish, drying method, cut, and size, all of which affect the price. Suppliers typically only have a limited range of choices. There are different quality grades for hardwoods and softwoods, and even different designations among grading standards, which can make things a bit confusing. FAS: hardwood firsts and seconds. No. 1 and No.2: softwood common grades (1 is highest). Other numbers are too poor for woodworking. A, B, C, D: softwood appearances grades (Finish or Selects; A is highest). Lumber may be rough or dimensioned. Rough means unfinished, the condition straight from the sawmill where the log was cut into pieces prior to drying. The surfaces and edges will be rough (wear work gloves when handling). It may still have bark edges, or it may have been ripped to rough width. Dimensioned (or dimensional lumber) means the rough lumber has been finished to specific dimensions by ripping to width, planing to thickness, and jointing. Because each step takes time and costs money, it can be sold as either partially or fully finished. You pay accordingly and do the rest (for best final surfacing, you'll still want to hand-plane lumber that's been thicknessed by machine, since the planer knives leave a noticeable surface; similarly for machine-jointed edges). Ever wonder why a two-by-four isn't 2x4? Lumber is specified according to its dimension when rough and green. This is the nominal dimension (i.e. the "named dimension"). Drying and planing then reduce the lumber to its finished dimension. Nominal 1" softwood loses 1/8" per finished side and 1/4" per finished edge (3/8" per edge for wide boards); nominal 2" loses 1/4" per finished side. So a one-by-six measures 3/4"x5 1/2", and a two-by-four measures 1 1/2"x3 1/2". Hardwood loss is 1/16" less depending on nominal thickness and number of sides finished. Feel cheated? It took time and effort for the lumber mill to convert that rough green wood to a dry smooth condition, just like turning rough diamonds into faceted jewels. Buying it rough is less expensive, and then you spend your own time and effort to smooth it. It's up to you to decide which way is worth it. For reasonable amounts of lumber, I like to start with rough; then I have the satisfaction of knowing the final result is more the product of my own effort. When I can't afford to take the time, I use partially or fully finished lumber. S2S: surfaced two sides (two faces, with rough edges). S3S: surfaced three sides (two faces, one edge straight and smooth, one rough). S1S2E: surfaced one face and two edges. S4S: surface four sides (both faces, both edges). Generally, the wood you see at the home center is all S4S. Drying method is either air-dried or kiln-dried (KD). Kiln drying is more controlled and more consistent, and is faster. However, if the lumber is left outside exposed, it's not much different from air-dried. Both methods are effective when done properly, and both can cause problems when done improperly. Air-drying is very practical for small amounts of lumber that you harvest yourself. Cut is either flatsawn or quartersawn (QS). Hardwood nominal thickness is designated by quarters: 4/4 is 1", 6/4 is 1 1/2", etc. Width is usually actual width. Length is usually actual length in 2' increments. Softwood is typically designated by nominal thickness and width: 1x8, 2x4, etc. Length is usually actual length in 2' increments. Lumber quantity is measured in two units, linear feet or board feet. Standardized lumber can also be priced by piece (for instance, 2x4's in 8' lengths), but this is based on some underlying linear or board foot price. 1 board 1"x8"x8' = 8 lf of 1x8. 3 boards 2"x10"x12' = 36 lf of 2x10. A board foot (bf) refers to a 144 cubic-inch volume of any dimension. For lumber in "random widths and lengths", bf is normally computed as the actual width and length of a given nominal thickness. 1 board 4/4x12"x8' = 8 squares = 8 bf of 4/4x12. 1 board 4/4x6"x8' = 8 half-squares = 4 bf of 4/4x6. 1 board 8/4x12"x8' = 16 squares = 16 bf of 8/4x12. 3 boards 4/4x6"x8' = 24 half-squares = 12 bf of 4/4x6. 1 board 5/4x7"x3' = (1.25x7x36) / 144 = 2.19 bf. 1 board 4/4x8"x43" = (1x8x43) / 144 = 2.39 bf. You'll appreciate careful measurement of those random widths and lengths when you're buying some precious exotic species that costs $40/bf. Pieces may be pre-marked in chalk with number of bf for easier totaling of the bill. Price per bf may also vary by specific ranges of width, length, or thickness, since some species may be less common in exceptional dimensions, and therefore more valuable. Some lumberyard personnel are human board-foot calculators, able to reel off combinations of different sizes to minimize your total price or number of cuts or glue-ups while you're still trying to figure the number of board feet in the first piece. They also use specialized gauges and rulers for quick measurement. Wow Steve this is an action packed post and I am impressed that you stuffed it with so much information. This is a great page to keep bookmarked for future reference. Thanks for the time and effort. Now one question, when "sawing" wood with a lightsaber does grain direction matter? Love your ice cream cone descriptions. Great post. Thanks! I put about two weeks into this one, a few hours at a time, double checking my references and trying to say things just right. 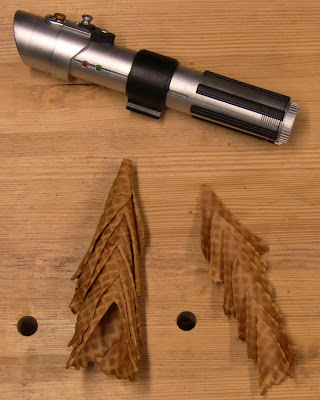 Alas, the dilithium crystals powering my light-saber are just about dead (the previous owner used it as an emergency power source for his hyperdrive coming from a galaxy far, far away), so it only has enough power left for ice cream cones. I can't take credit for the ice cream cones analogy, but I do take credit for taking it to the nth degree! This as to be ne of the best write up in it's category!! Realy like it, Thank oyu for your time and effort put into it! That is an amazing write-up, Steve! You should turn this into a book. Great website and resource for a newbie woodworker here in the UK. Fantastic post, as a newcomer to woodworking i have found your website to help me understand my hobby greatly. Thanks, Jack, I'm glad it's been helpful! I second Jack's comment. I'm in the same situation and find this blog very informative. I second Jack's opinion. I'm also a newcomer to WW and find your blog to be very informative.